We stock all the Stratocaster® parts and accessories you'll need for repairing, restoring or building your Strat®. Top brand names like Fender®, Seymour Duncan, Kluson, Gotoh, CTS, Switchcraft and CRL. 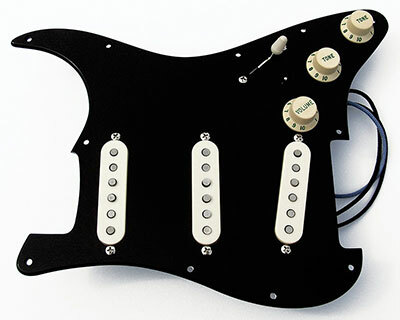 Currently we're specializing in a Gilmour Black Strat® inspired loaded Black Strat® pickguard assembly. To complement this project accurately, we are fabricating the unique black 1 ply 0.120" Acrylic pickguard with the rounded and polished edge along with the Seymour Duncan Custom Shop hand scatter-wound SSL-1C DG bridge pickups. 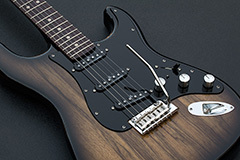 Visit our Gilmour Black Strat® Inspired Parts page to view all of our parts and accessories that'll assist you in completing your Gilmour Black Strat® inspired build project correctly. If you're building a Gilmour Black Strat® inspired guitar and you're looking for the most authentic and accurately reproduced loaded pickguard assembly you can find? Then your search is over, we're custom building complete Gilmour style Black Strat® pickguard assemblies that are the most authentic of all replicas being built. You'll appreciate the effort we have put into accurately reproducing one of the most popular signature series custom Strat® projects. 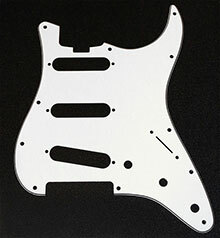 For full details check out our Black Strat® pickguard assembly page. 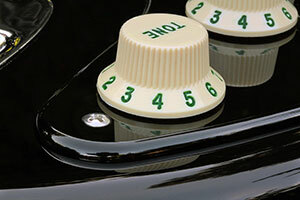 Are you looking to change the tone of your Strat®? 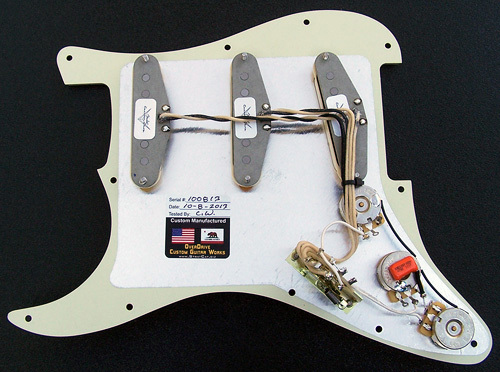 We can custom build you a loaded Strat® pickguard assembly with the pickup set of your choice. We can build you one with any of the genuine Fender® pickup sets as well as Seymour Duncan pickup sets and a few custom designs that only we offer. 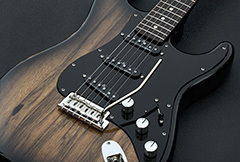 Check out all of our complete Strat® pickguard assemblies here. We just introduced new pickguard color and style options for the new Fender® American Elite Strat®. No longer will you have to be constrained to the Mint Green or Tortoise Shell pickguard that came with your Elite Strat®. Due to the unique design changes and requirements of the pickguard for the Elite Strat® it prevents you from using a normal pickguard. We are able to custom manufacture one of our Black or White Acrylic 1 Ply 0.120" pickguards with the Rounded and Polished Edge or customize any of the genuine Fender® pickguards to better suit your color theme needs of your Elite Strat®. For full details on the SSS version click here, for the HSS version click here. We are now stocking brand new genuine Fender® Stratocaster® replacement necks. For full details on each of the various models of Strat® necks we offer visit our necks page. 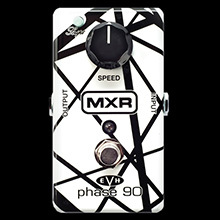 We now have a limited supply of the MXR EVH 35'th Anniversary Special Edition Phase 90.. In 2013 Jim Dunlop celebrated 35 years since the debut of Eddie Van Halen with the limited edition 35th Anniversary Series of EVH signature effects featuring limited edition finishes based on his legendary “Black and White” and “Frankenstein” guitars. With premium quality high gloss paints, the result is a collection of richly finished pedals that are as ready for the showroom floor as they are for the road. 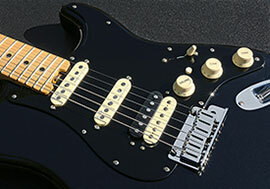 We have this unique pickup that a lot of you serious Gilmour Black Strat® inspired builders have sought after. These are original, authentic Seymour Duncan custom shop's hand scatter-wound pickups. 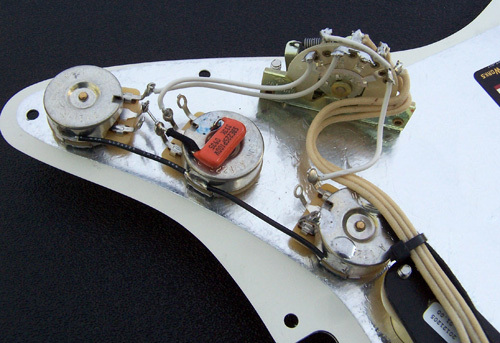 These pickups are available separately or installed in our Complete Black Strat® Pickguard Assemblies. We also have a Reverse Wind / Reverse Polarity version of this very same pickup to give you a couple pickup selections of hum cancelling. We custom manufacture stainless steel tremolo arms for the Fender Strat® or any guitar that accepts a 10-32 or 5mm thread-in tremolo arm, we also manufacture the American Deluxe, Elite and Pro Strat® pop-in tremolo arms as well as the elusive '83-'84 Elite Strat® Freeflyte pop-in tremolo arms. 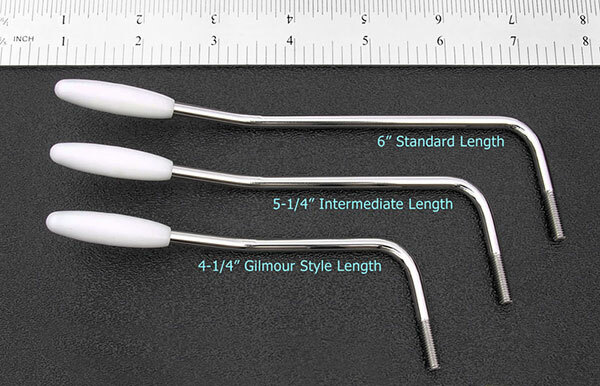 Our most popular tremolo arm is the short 4-¼" Gilmour style length. We also offer the standard 6" length and an intermediate 5-¼" length. Each of our Strat® tremolo arms are manufactured by hand, they are not mass produced. Each Strat® tremolo arm is manufactured one at a time by hand to a unique set of specifications for each model of Strat® it is created for.